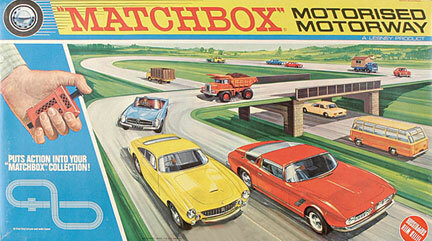 Matchbox Cars were the greatest, most fascinating toy cars of all! They were die cast with extreme precision with the details of a model. All had moveable wheels, and others had movable, or removable parts. 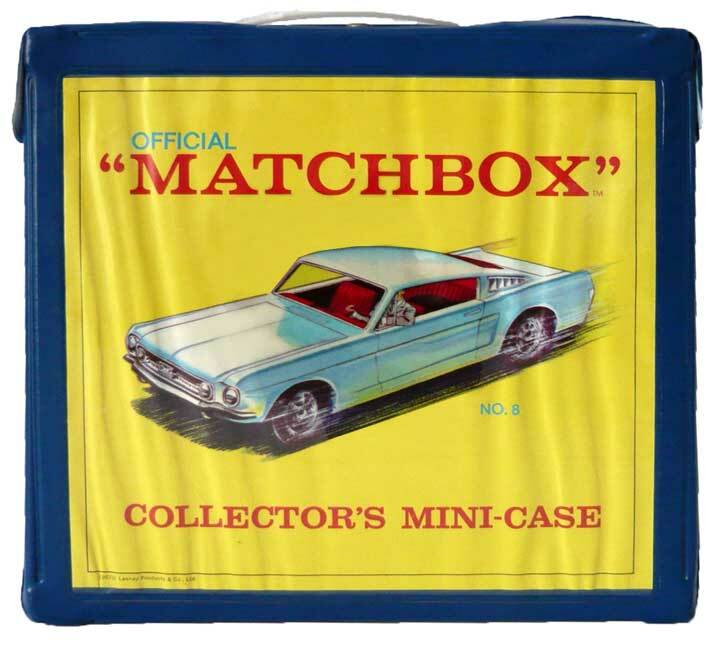 I loved Matchbox Cars, and had many of them, including the cool carrying case! 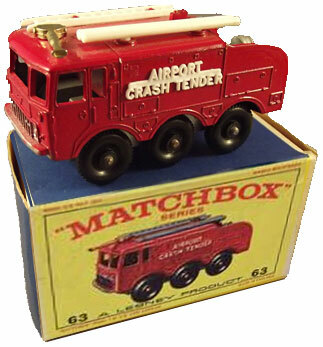 Matchbox Cars were perhaps among my most cherished of all toys. Among these most splendid toys were G.I. Joe and my trusty Mattel "Tommyburst" Machine Gun. The cars themselves were extremely precise, with die-cast engravings for extra detail like car door gaps, engine parts, nuts, bolts, lettering, and tons of extra detail. They were wildly fascinating, and cost a healthy retail price of 55¢ per vehicle. The price was a lot then, so I could really only get a few of them a month. It was a slow acquisition until one glorious day, when my mom and the next door neighbor woman got into a buying war. Our neighbor loved to spoil her kid and buy him anything that I had. So my one day my mom got mad, went down to Newberry's and bought every Matchbox car she could find! It was a WOW moment for me! My first Matchbox car was in the spring of 1967. "Up, Up and Away" by The Fifth Dimension was playing on the radio. I rode with my Dad to Eastport Plaza as we went to Newberry's. In the toy basement, in a sealed glass carousel, sat an array of wonderful yellow boxes. The Airport Crash Tender I was wildly fascinated by this vehicle. All the wheels, the removable ladders, and the detail of the back with all the pumps and hoses and equipment boxes made this a must-have toy. The more odd the vehicle, the more I was drawn to it. 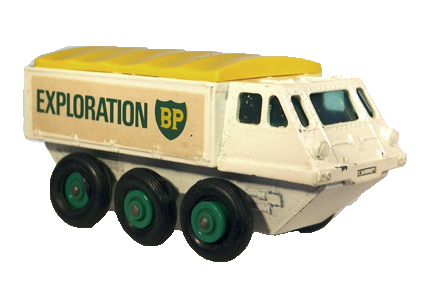 I think that every Matchbox fan out there can agree that the BP Exploration Truck was among the most bizarre of the entire Matchbox line. Judging from the bolted windows and the 6 wheels, we all assumed that this was some sort of amphibious vehicle which made its allure magnetic! This was probably my second favorite MB car. 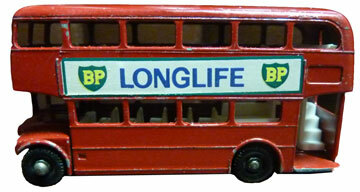 I think that my first favorite was the classic Double Decker Bus . I loved that winding stairway in the back! I used to daydream about riding around town in that top part of the bus looking out over the streets of London. I also had the carrying case as shown in the picture at the top of this page, but it didn't hold all the cars I had. Anything used for construction or any utility vehicle was my favorite. I liked the snow plow, the Kent fire truck, the road grader, caterpillar, the Hoveringham truck, the snow-trac, and anything else that was otherwise heavy equipment or powerful looking. Other favorites were the accessories, such as the cattle truck with the removable cows, or the boat and trailer, the motorcylcle, and the John Deere tractor with the trailer and removable yellow barrels. These cars looked great in the grass, giving them a driving-through-dense-jungle or underbrush look. It was fun to hook up the boat to the yellow jeep and drive up to a mud puddle and launch the boat. My parents, knowing that I loved these things so much, decided one year for Christmas, to build a Matchbox city for me! The project was supposed to be a secret, but it was so big, that I ended up helping out on it. They had an arts and crafts blast making houses out of Styrofoam, and shrubs out of sponge and moss. They got into it so much, that they ended up buying extra felt for the lawns, more paint brushes and paint, and pretty soon, my parents were modeling just like I would do in my room! Finally, they could experience first hand, the joy of modeling. In essence, they created a large-scale Matchbox diorama. Better yet, to finish off this marvelous piece of work, they decided to buy the Matchbox Gas and Fire Station to put onto this thing! I'm telling you, there was nothing like it. The Matchbox Gas Station had a really cool ramp that went up the back to what appeared to be some sort of showroom. In my younger way of thinking, it was really just wasted space, so I pretended that it was a parking area for cars needing to be worked on. The Matchbox Fire Station had a sliding pole in the back, and two levels. It had red swinging barn doors in front, but, with the exception of garage-type roll up doors, it typically, didn't look too much different than American fire stations at the time. Unfortunately, I have no pictures of this amazing diorama, but it was amazing! There were painted roads with traffic lines, telephone poles, road signs, speed signs, and an HO scale barn which I built. 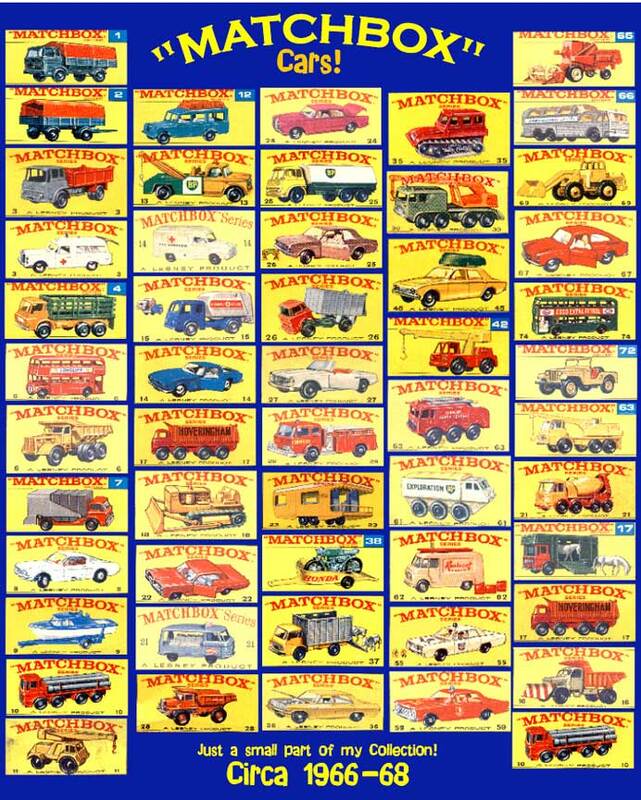 I think it was around 1968 when Matchbox came out with their coolest offering: The Matchbox Motorway set that turned your entire collection of Matchbox vehicles into slot cars! The entire principle was a spring that ran under the tracks just below the groove. Foil stickers were applied to any matchbox car that had the space to hold it, and a plastic pin would feed into the spring. The cars would be pulled around by the spring. However, this didn't work out well at all, and the first models of this set, (I don't know if they improved or not), were a complete bomb. Naturally, the spring had problems consistently travelling around the track. It was a sad day indeed when I finally had to admit that I'd outgrown these cars. It's funny how life could age us, push us forward, and take away the games and toys we so loved only to prepare us for the future ahead. Thankfully, there are grandchildren in my life, boys, who are growing strong, and making their own discoveries. For us guys, we're always boys, and always will be; I've found myself on frigid winter days chasing my grandson around his back yard as we shot at each other with tree branches that were pretend army guns. We built great fortresses out of Lincoln Logs, and played with cars. The greatness of life that we remember so well from our youth really doesn't change, it just takes some rather long, and cumbersome detours. When the Matchbox Cars faded from my life, they never really returned, but the memories are as strong and as new as the shiny new vehicles that rested in my plastic carrying case.